Told from the perspective of original singer Steve Marriott, ALL OR NOTHING charts The Small Faces brief rise to fame from a gang of East London wannabes to legends of London’s swinging music scene. The story starts in the early sixties, with a young Steve Marriott (Tim Edwards) larking about at school. Whilst working at a music store, he meets Ronnie Lane (Joshua Dowen) and Kenney Jones (Drew-Levi Huntsman) and the trio – along with keyboard player Jimmy Winston (Joseph Peters) – decide to form The Small Faces. The band quickly become stars, living the millionaire lifestyle but soon the rollercoaster journey of endless tours, gruelling schedules, pills and perpetual parties start to take its toll, ultimately leading to the self-destruction of the band and the ultimately death of the lead singer Steve Marriott. Poignant, colourful and full of energy, ALL OR NOTHING is a bittersweet tale of four charismatic young kids who hit the big time. The half play, half gig encapsulates all that is Mod, capturing The Small Faces’ unmistakable mix of anger and arrogance as they climb the musical ladder of success only to be exploited, ripped off and betrayed by their cutthroat manager Don Arden. Chris Simmons narrates the story, treading a fine line between smugness and charm to deliver an entertaining and bittersweet performance as the older, deceased Steve Marriot. There’s some good work too from the supporting cast with Russell Floyd as the band’s cigar-chomping manager Don Arden and Daniel Beales as Sonny (of Sonny and Cher) and Tony Blackburn, standing out in particular. But the real stars of the show are the members of the band played by Joshua Dowen, Josh Maddison, Drew-Levi Huntsman and Tim Edwards. The skilled actor-musicians act out the band’s story, bringing hits such as Whatcha Gonna Do About It, All Or Nothing, Tin Soldier, Lazy Sunday, Here Comes The Nice and Itchycoo Park, to life on stage. Yet for all its energy and finesse, the show isn’t without its flaws. Some early pacing issues make for a slow start and the predictable storyline and cliché jokes may not be to everyone’s taste. 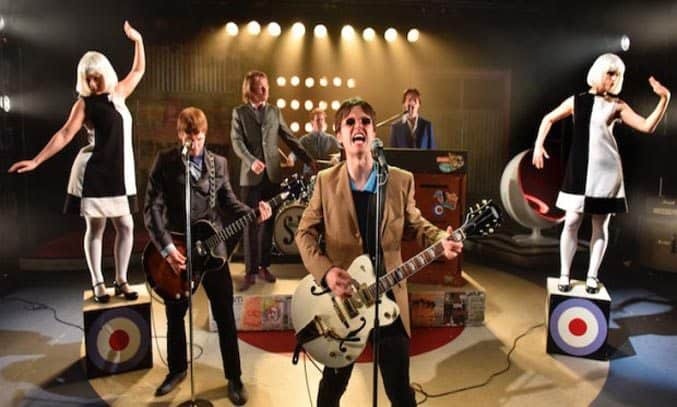 The musical is also aimed at hard-core fans with the story stopping with the exit of lead singer Steve Marriott, touching only briefly on the continuation of the band without him (as The Faces) with Rod Stewart replacing him as the frontman. That said, there are enough flashes of humour to keep the energy high and plenty of cameos to satisfy even the most ardent fan. Unlike other jukebox musicals which bend the narrative to match the lyrics, Harrison’s down-the-line approach also lends a refreshing realism to the musical numbers. If you’re a fan of The Small Faces, you’re sure to enjoy ALL OR NOTHING. An entertaining new musical that is as vivid and colourful as their music. ALL OR NOTHING runs at the Opera House, Manchester until 22 October.